Fan-favorite comic book creator and film storyboard artist Gabriel Hardman (writer: KINSKI, Hulk, Planet of the Apes, storyboard artist: Inception, The Dark Knight Rises, Interstellar) teams up with co-creator Corinna Bechko (HEATHENTOWN, Savage Hulk, Star Wars: Legacy) for an all-new science fiction series in INVISIBLE REPUBLIC, VOL. 1. This collects issues #1-5 into trade paperback and will be available in August. In INVISIBLE REPUBLIC, VOL. 1, when a reporter unearths the secret history of the recently deposed dictator of a remote colonized moon, he discovers that exposing secrets can be deadly. 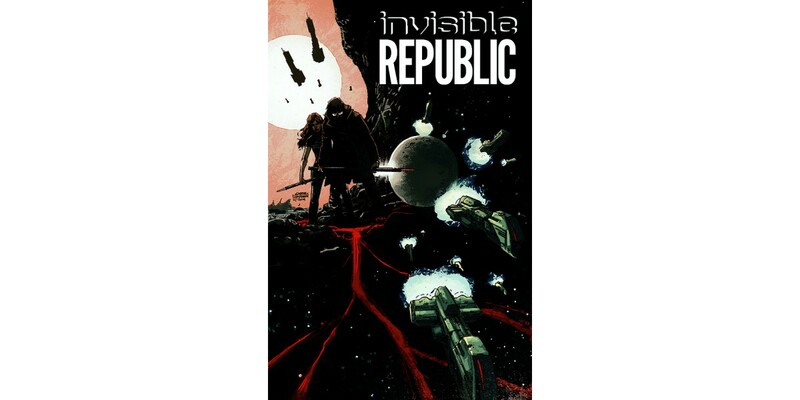 INVISIBLE REPUBLIC, VOL. 1 (ISBN: 978-1-63215-408-8) hits comic book stores on August 19th and bookstores on September 1st, and will be available for $9.99. It can be ordered by retailers from Diamond Book Distributors with Diamond Code JUN150545. It can be pre-ordered now on Amazon, Barnes & Noble, and IndieBound.